Airport location identifiers, commonly known as airport codes, are assigned to airports throughout the world by the International Air Transport Association (IATA). Along with airline designators and transport document accounting codes, these three-character codes are required to identify airlines, destinations, and traffic documents. These three sets of codes are used by myriad computer systems to process passenger and cargo traffic information smoothly and efficiently from beginning to end of each flight. Opb Staff. Oregon Public Broadcasting. Sunday, 21 Apr 2019 00:28:00 +0000. Reuters. Saturday, 20 Apr 2019 19:37:11 -0400. The United States Federal Aviation Administration (FAA) designates publicly owned airports having more than twenty five hundred (2500) passenger boardings per year as Commercial Service Airports. Of these airports, those having more than ten thousand (10000) passenger boardings per year are Primary Commercial Service Airports or simply Primary Airports while those having at least twenty five hundred (2500) and no more than ten thousand (10000) passenger boardings each year are Nonprimary Commercial Service Airports. All Primary Airports are further designated as large hubs, medium hubs, small hubs, or nonhubs, based on their share of total U.S. passenger boardings during the previous calendar year. The larger hub airports generally offer scheduled air service to a broad selection of domestic and international destinations. Many of these airports feature shuttle services or automated people movers to assist passengers who are changing flights. In addition, many of them have some form of direct intermodal ground connections to local bus and rail transportation systems. However, few hub airports have direct connections to Amtrak rail service or even regional bus service. The FAA also designates Cargo Service Airports. These airports are served by aircraft that provide air transportation of only cargo with a total annual landed weight of more than 100 million pounds. "Landed weight" means the weight of aircraft transporting only cargo in intrastate, interstate, and foreign air transportation. An airport may qualify for both commercial service and cargo service. Lastly, the FAA designates publicly or privately-owned Reliever Airports that are used to relieve congestion at Commercial Service Airports and to provide general aviation access to the overall community. The remaining airports in the USA are commonly considered General Aviation Airports. These airports represent the largest single category of airports in the United States of America. Note that this category includes privately owned, public use airports that enplane at least twenty five hundred (2500) passengers per year and receive scheduled airline service. On AirportCodes.us, you will find U.S. airport tables that list primary and nonprimary commercial service airports and their passenger enplanement data as well as cargo service airports and their landed weight data. Most of the tables are sorted by airport code and include each airport's name, city, and state. Some of the tables are also sorted by airport name and by state abbreviation. Information on this site was synthesized from publicly accessible data provided by the U.S. Federal Aviation Administration and other sources. Note that airport classifications may change from year to year as their passenger or cargo traffic fluctuates. Airport codes for major airports in other American and overseas countries is available on our world airport tables and at the IATA's airline and airport code search page. The International Civil Aviation Organization (ICAO) is a United Nations agency that assigns a 4-letter identifier code to each airport. In the United States, an airport's ICAO code usually consists of the letter "K" followed by its 3-letter IATA-assigned code. In other countries, the first two letters of the ICAO code define the country and the last two letters define the airport. An alphabetic list of ICAO airport codes may be viewed at AirportTechnology.com's ICAO Codes page. 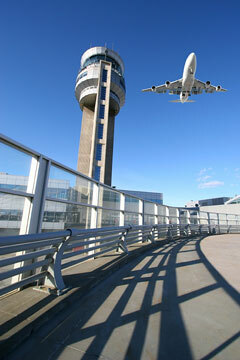 Air Traffic Controllers - air traffic controller career information. Airport Design - information about airport planning, siting, and development. FlightAware - information about aviation, flight tracking, and airport activity.